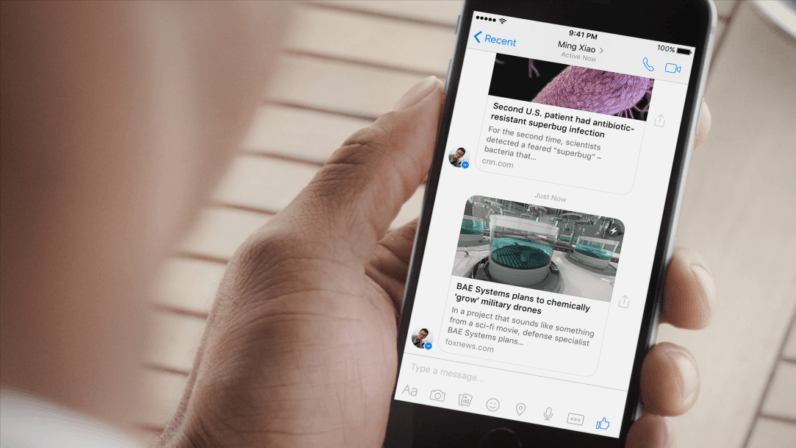 Facebook is making reading links your friends share on Messenger much faster. The company today announced its integrating its Instant Articles technology right into the app, meaning that you don’t need to open a browser to quickly read breaking news or the viral listicle of the day. Facebook says the articles will load up to 10 times faster than traditional links. It’s also particularly handy for people who are on slow or capped data connections, as Instant Articles reduce the amount of data needed to load a post. While many publishers have already jumped on Instant Articles, that doesn’t quite cover everyone, which will lead to some odd discrepancy while clicking links. Still, for Facebook, this is just another way to motivate publishers to adopt the feature. At least you can tell which posts are of the instant variety by looking for a little lightning bolt at the top right of embedded links. Instant Articles is launching for Android today, and will hit iPhone next week.